Get Better Homes and Gardens Magazine for $0.50 An Issue + A Free Gift! 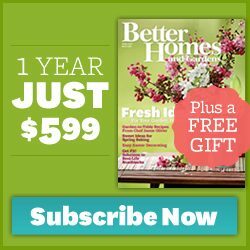 You are here: Home / FREEbies / Get Better Homes and Gardens Magazine for $0.50 An Issue + A Free Gift! I have another fantastic magazine deal for you all! Right now, you can get a 1-year subscription to Better Homes and Gardens Magazine for $5.99! That’s just $0.50 an issue! You’re sure to find ideas and tips more valuable than that in each copy. This also makes a great holiday gift for a friend or relative! And, when you subscribe, you’ll get a FREE gift – Better Homes and Gardens’ All-Time Favorites Cookbook!